The L2798 is a thin wire premium 60-degree jig hook with an extra-fine needle point, flat eye, chemically sharpened, plated in black nickel. Very Sharp! Use with Caution! Available in sizes 3/0 thru 5/0. Use with the new Do-It Weedless Round jig molds, SHR-6-A, SRH-6M-SLA, ARK-3-AFC and the FBB-6-SLA. Engineered design for increased sharpness and curability. Superior Penetration, Increased Hook Up Ratio. Perfect combination of sharpness, strength and design. 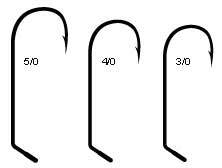 These hooks are super strong, super sharp and simply the best value in premium needle point fish hooks! 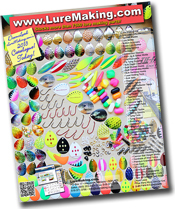 Ideal for your premium custom jigs. Made in USA!